It’s been a week since I’ve posted anything! I feel kind of rusty at it but I threw out a kind of challenge last Monday about adventures and we had one. That’s why I’ve not written or commented on your blogs because I was devoting all my energies to the adventure. 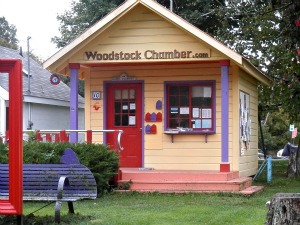 The Woodstock Chamber of Commerce. We drove to Woodstock. Yeah, hippie-dippy, groovy Woodstock. We’d heard it was an eclectic place and since there’s a big writing festival every year here, we thought we’d see what it was about. And it was groovy. But it was wet. From the time we left home from the time we left Woodstock. Raining, every single day and night. I gave up on my hair — it was big, wavy and wet the entire time. But hey, back in the day, I think Woodstock was a big hippie rain fest so maybe it was meant to be. (Even though the actual concert was held in Bethel, an hour away, Woodstock gets the glory). Despite the rain, we soldiered on and had ourselves an adventure. 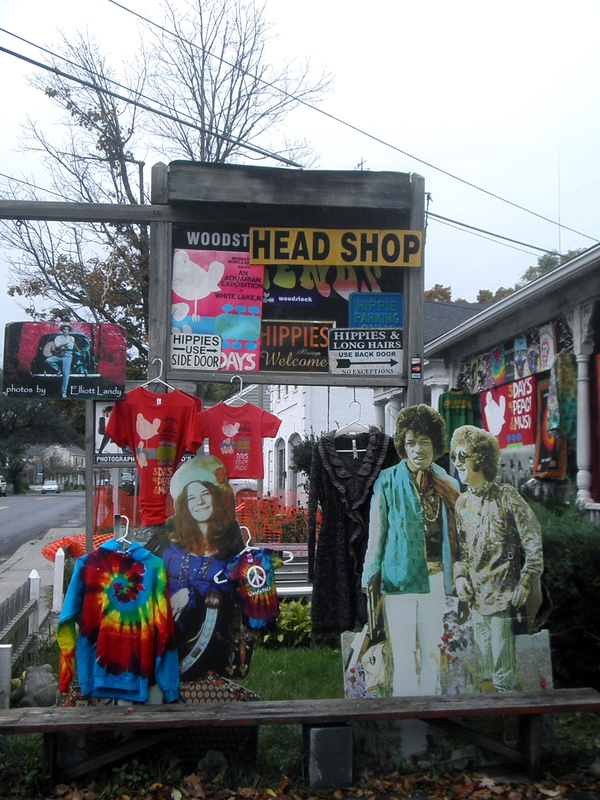 Woodstock has a specific, creative and funky vibe to it. There are those that walk the streets that seemed to have stepped out of the fields of the concert it was named for. There’s also the very wealthy that either live there in some of those large houses tucked up in the hills or that live an hour or so away and come to Woodstock to get their groove on, I’m guessing. Downtown Woodstock near the Village Green, center of town. Every Sunday a big group of Woodstockers allegedly beat on drums and the air is filled with patchouli. A Cow statue outside of a vintage shop in Woodstock. Everything’s groovy and smelling of patchouli. Rain, humidity and patchouli. Some of vintage apparel had vintage stains on them as well. I got high off the patchouli smell (just kidding, but it did give me a headache). What one looks like from smelling too much patchouli. 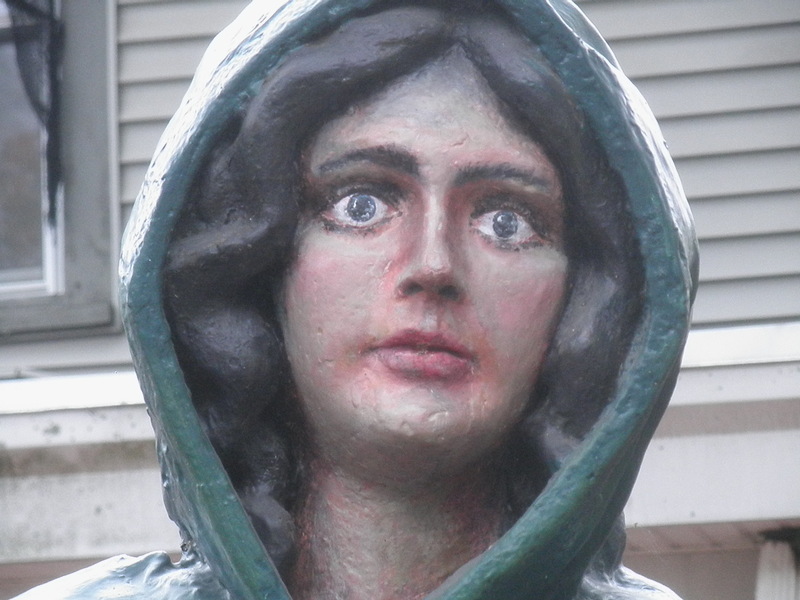 (Statue outside a vintage shop). Then there’s other shops that have hand-loomed scarves that sell for over $500 a pop. Seriously, a giant loom with people making scarves and jackets. And plenty of boutique shops with designer clothing. 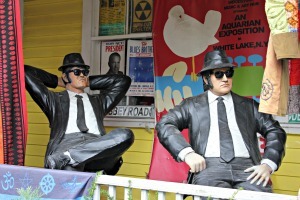 The Blues Brothers feeling blue because they’re smelling so much patchouli. So you’ve got over-priced clothing, shoes and scarves in some places and vintage, hippy garb in others. And all sorts of people and incomes intermingling in one place. We had a dinner one night and went upstairs to a place called the Java lounge where, like the name suggests, you can get a coffee drink. 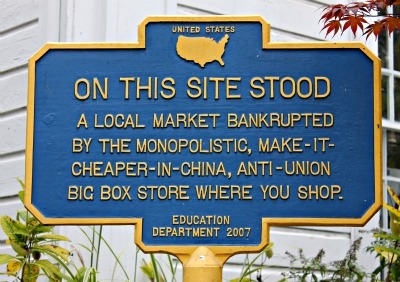 A sign outside the Woodstock Museum. I bet these guys like patchouli. As we were walking down the street one day, we almost bumped into a guy carrying some groceries and a large box. He was dressed in pants that were made of multi-colored velvet squares, a paisley shirt and his tangled hair sprung out and flowed down his back from a gray, dingy cap with a short bill. “How ya doing,” we nodded and said as we were passing. 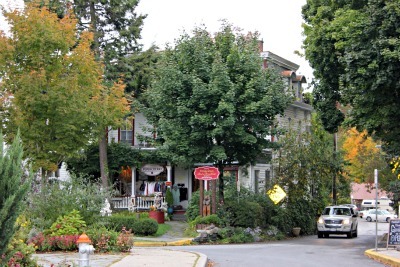 A giant patchouli-smelling vintage clothing shop — one of several — in Woodstock. “I’m great man!” He spread his arms open with his groceries in one hand and his big box in the other. “It’s raining, I’m going to go snuggle up with my lady and I live in Woodstock, what could be better?” We saw him the next two days, walking around with the same velvet pants on. 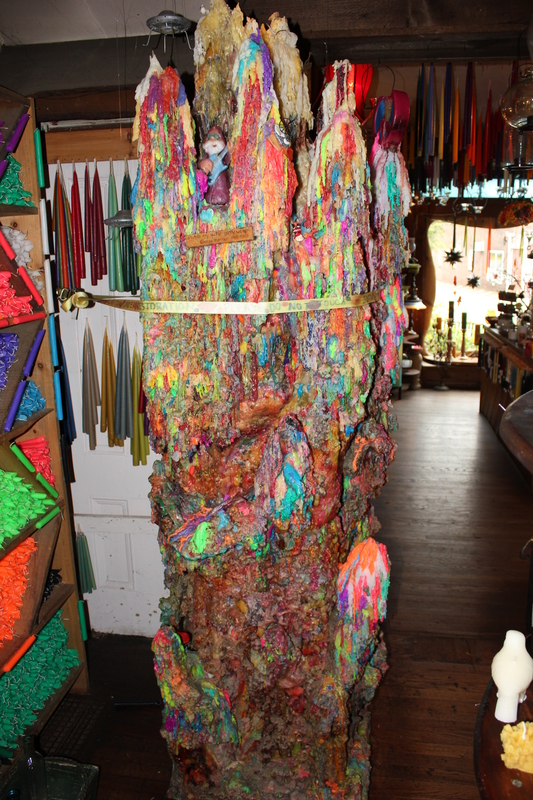 A giant Wax statue in a candle shop. It didn’t smell like patchouli. 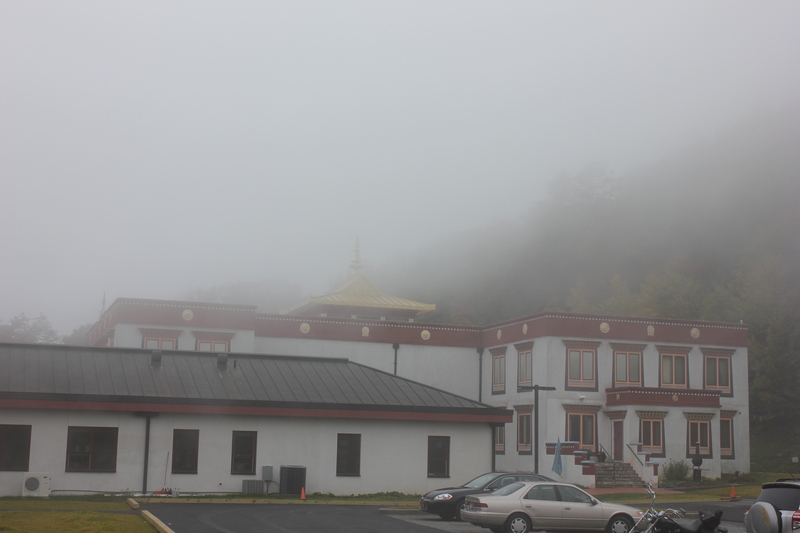 Tibetan Monastery up in the clouds. 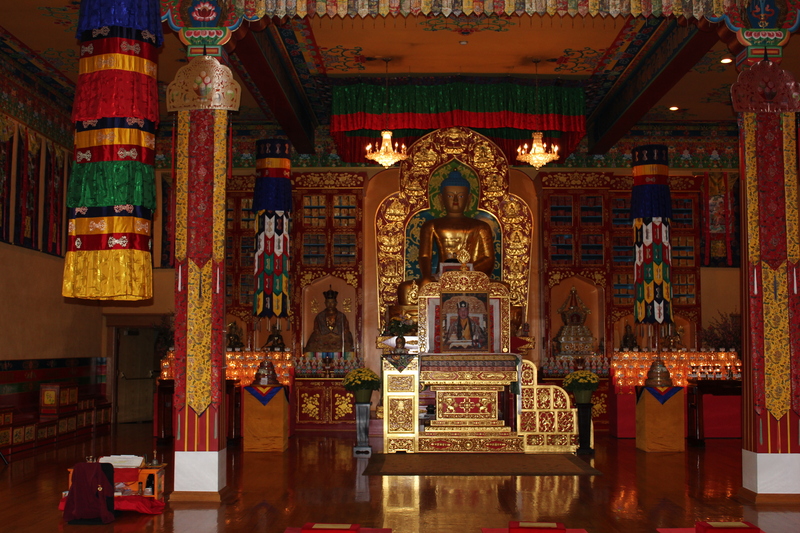 We visited the Tibetan Buddhist Monastery that was perched so high up on a mountain that we were up in the clouds. The clouds that stayed there the entire time we were there. Did I say it rained? Misty rain, sometimes rain that came down in sheets and humidity. And it was warm. But the leaves were turning and it was beautiful along some of those roads. 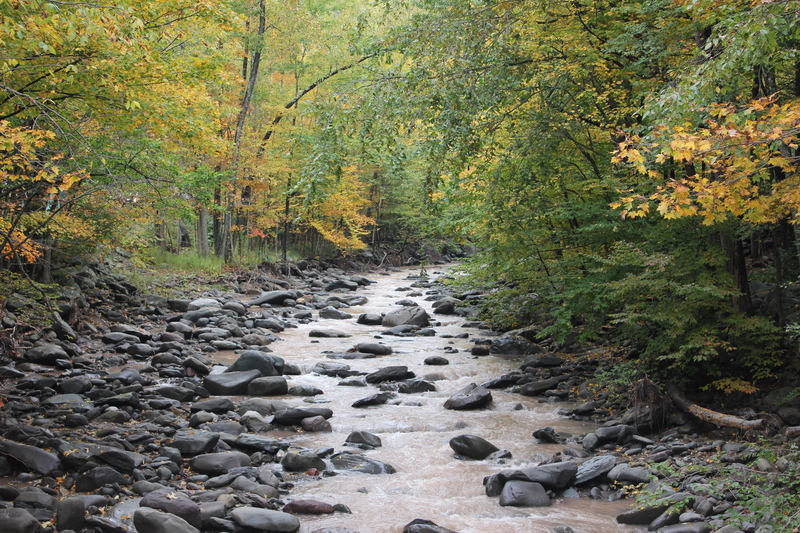 A stream up in the mountains in Woodstock. 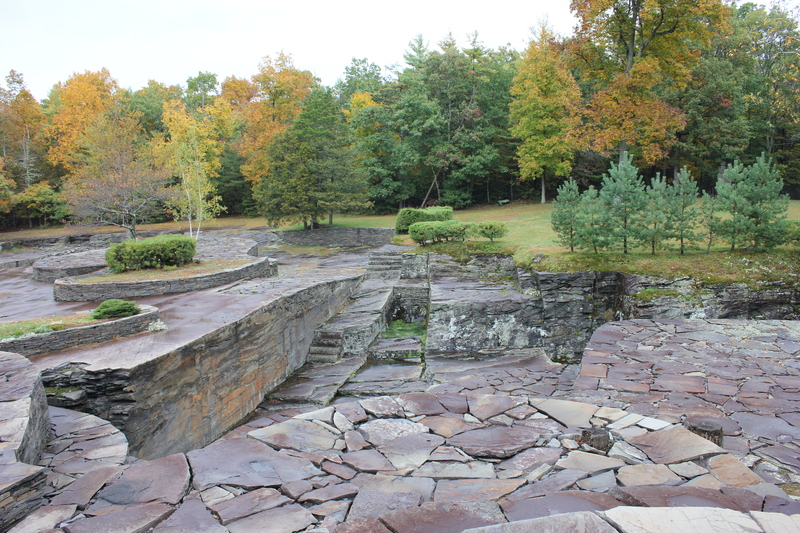 We visited Opus 40, a sculpture park that’s pretty incredible. Harvey Fite is responsible and his inspiration came from Mayan culture. We were the only ones there (because it was raining) but it was pretty impressive. 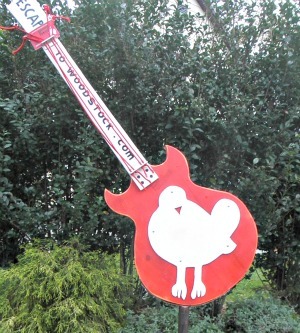 One of several guitar sculptures (about 40) scattered along Tinker Street in Woodstock. 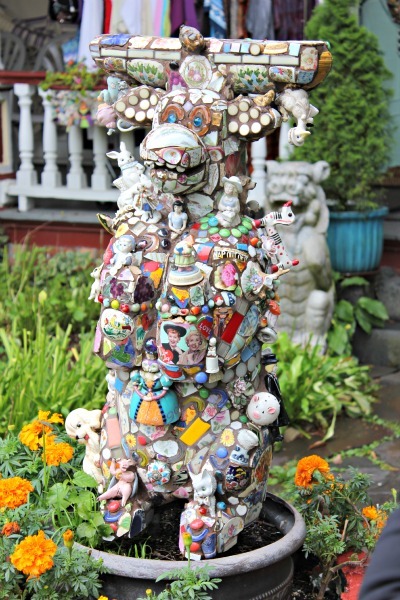 Very cool — each one is made by a local Woodstock artist. We took our time during our “adventure” and were able to at least visit another place that we’d not seen before. Although we may have explored more had it not been raining (it was beautiful the day we left), we finally just gave in, pretty much stayed soaked the entire time and laughed about it. After all, what are you going to do? I’ve called so many places home. I think some of the fun of going to another place is also gaining a new appreciation of home. I love to travel, but there’s also a kind of excitement or relief about coming home isn’t there? No matter how brief or long our adventures are, it’s so nice to get home. Clicking my ruby reds whilst saying, “There’s no place like home, there’s no place like home,” when I got home. And nothing smelled like patchouli. We pack up little pieces of ourselves to journey to different places. I think we do that to carry a little “home” with us. I don’t know about you but when I first walk in the door of my home — the sights, sounds and smells that greet me are just as nice as the adventures I take now and then. Maybe better because, you know — there’s just no place like home. Happy Monday everyone and press play for some “Woodstocky” kind of music. Peace. It was cool. Yeah, that was wax thing was a monster!! I don’t know what it is about patchouli, Carrie and it’s nice in small doses, but seriously it wafted out into the streets… It is wayyyy groovy. Peace, sister. Lou Ann, you’re welcome and it’s so nice to be missed! Seriously, Le Clown crying?? C’mon, I can’t believe that but it’s nice that he missed me too. I missed everyone! I could send him a guitar picture — what do you think? I’ve got several — they were EVERYWHERE. HA!! That is so funny, but I guess, now that you mention it…. This would have been a really fun little trip. (I mean “trip” in the traditional sense of the word.) haha! I seriously love all the music from that Woodstock time period. I could easily have become groovy Grippy with flowers in my hair if my life had taken me in that direction. I love the smell of patchouli, though I can imagine too much would give you a headache. Upstate New York is gorgeous this time of year, isn’t it? Thanks for sharing this little piece of history with us. Now I feel like I’ve been to Woodstock. I think I’m gonna go put on some Crosby Stills and Nash. Hi Grippy. I can see you twirling around with flowers in your hair. :). So glad you enjoyed and it’s nice to be back home. It was fun and I could’ve written more and posted tons of pics, but hey there’s only so much one can write to keep others’ attention. I like patchouli as well, just not all the time, every day. It is quite pungent. Hey Brig. My ancestors founded Bedford! Can you believe that? I grew up right next door in, Chappaqua. You were in my neck o’ the woods. How cool is that?! Lots of celebrities live in Bedford including Richard Gere, Glen Close, Meryl Streep, Susan Sarandon, etc. It’s full of ’em. Actually that was a long time ago – I’m only certain about Richard Gere, at this point. In fact he has a Bed and Breakfast. That would have been a particularly good time. Can you imagine sitting down to breakfast with Richard Gere!? haha! Wow! That is SO COOL. You grew up near there? I could write a post about that — it is so beautiful! I didn’t know all those celebs lived there but my gawd, the homes and horse farms — WOW. And yes, I would love to sit down to breakfast with Richard Gere — duh! I wonder if he’s visited the monastery in Woodstock. He is a big Dali Lama supporter and Buddhist. He may very well have — it was stunning. Lovely post! I have no idea what patchouli smells like, but I now wanna try it at least once. I love visiting places during the rains. Something about the mistiness and the relentless pouring captivates me. BTW, how was the writing festival there? Hi Aparna! Thank you. It’s a very sweet-ish kind, foresty smell. I’ve not been to the writers’ festival. I wanted to visit and maybe go next year. I think it’s every May. This past year they had Augusten Burroughs so I think it’d be cool to go back then. Thanks for your comment, friend. I love the adventures that come with age, when we set out to do something new. But I love coming home more with something to ponder and a new perspective. Thanks for the groovy tour! Yes, they’re nice, Rep. I love traveling but still I do love my own bed too, know what I mean? Thanks for stopping by. Just watched the movie, “Peace, Love and Misunderstanding” this weekend, which takes place in Woodstock. Anytime you want to revisit, you can probably just pop this DVD in the player and go! (got it via Redbox… hey… a buck thirty for a cheap night in… can’t beat it!!) I used to stop in Woodstock sometimes on the way up to my favorite campground just north of there where you can hike your way up to the top of Haine’s Falls or catch one of the events at Hunter Mountain (Oktoberfest!). Upstate New York has SO much to offer . . . ALL of it is lush and beautiful! ENJOY!! Sue, I’ve not heard of that so I’ll have to pick it up. Upstate New York is gorgeous and we’re beginning to explore it more and more. They’re are little towns up there that look like Norman Rockwell painting. So beautiful. Thanks, friend and so nice to have you back. :). I’m in Portland which is weird enough but Eugene has its own special weird! yes, it is beautiful but, like you, I don’t need that much patchouli in life. I’m thinking of flying into Syracuse going to see my alma mater going through the Finger Lakes and waaaayyy up state to my mom’s hometown and into Vermont. We did and it was frustrating at times but we had a little backyard so we were able to have a nice glass of wine (or two in the backyard underneath a large umbrella and table). We wanted to hike but it was way to slippery and muddy to do so. Still, exploring is always fun. I haven’t been to the Socrates Sculpture Garden but I will most definitely check it out — thank you, friend. xoxoB. You remind me I’d like to visit Woodstock one day. Sorry the day was rainy. Patchouli — ahahaha! I wear it every day — yeah, I’m a funky hippy 😉 I mix it with jasmine — I try not to wear it to be so headache inducing to others however. You make me think of that walk I took in Riverdale in the luxury apt. area. When I got home I felt like it was a special place. I had a song ringing through my head that day as well and it’s uncanny because I never really listened to the lyrics — only the predominant refrain which was ‘back home, back home’. It’s that song “Back Home” by the Bee Gees — great little sweet short song by the way. I wondered why every time I think of that walk I think of this song. I finally listened to the lyrics and was in shock. They talk about going to Cairo, and meeting Lyndon B. Johnson, going here and there, but they find their “Shangri la…in a place that’s not too far, back home.” They’re saying what we’re saying, that after going out and traveling, walking, we come back home to our special places. Thinking of that song in association with that day is wild because I wasn’t aware that I was probably computing those lyrics subconsciously. Wild how the brain works. I didn’t want to be obnoxious and post the song but if you ever get a chance — if you haven’t already heard it that is — check it out. It was frustrating but not much you can do about the weather, right? I like patchouli, but in smaller doses than what permeated some of these shops. I bet you are a funky hippy girl and that is wonderful. I remember that post you wrote and it was so beautiful — the way you wrote it — it sounded as if I was right there with you. I’ve not heard this song, Sandee but I’m going to make it a point to find it and listen to it. Thank you and I love how your brain works btw. :). Uh-mazing! There was a taco shop on the main drag I visited 5 or 6 years ago – one of the best tacos I’ve ever had. While the patchouli and patch-work pants can be a bit much, the surrounding area of Woodstock is stunning, as I’m sure you saw on your October ride up. I used to Pumpkin pick in New Paltz each year, get a little bit of Ohio-home feel before heading back to the city. You’re a travel writer now, Brigette!!! Why thanks, Mike. It is still there! I’ve got a picture of that taco place though we didn’t eat there. We ate at Oriole 9 — was that there when you visited? It has this big blackboard that let’s you complete this sentence: I want to __________ before I die and people write their stuff up there. I’ve heard of New Paltz and SOOOOO want to visit their as well. Glad you enjoyed Mike and consider it a great compliment coming from you — you being the consummate travel writer, my friend. The ‘before I die’ concept was started by artist Candy Chang, in New Orleans. She even does a TED Talk on it. Really really really inspiring/motivational stuff if you get a chance to watch. New Paltz is amazing; you can drive up to the farm stands, grab pumpkins, apples – and I think the local farmers sell at the Union Square farmers market. Sorry to ramble…consummate travel writer? No. Bumbling, stumbler – yes. It doesn’t take much of any scent to give me a headache, so I think I would’ve had a migraine every day from what you just described! But it sounds like you had a fun trip, despite the rain and lingering scents. 😉 I love travel, too, and coming home has that special feel to it. Glad to see you back! Hi J, I’m kind of like that myself, especially if it’s really strong. It was a fun trip and it was fun getting back too. ;). Thank you so much. Jackie! Ha — no way, chick. I’m good on the patchouli for awhile but thanks for the gesture. ;). I’ve lived in New York for 30 years and I’ve never been to Woodstock. Thanks for sharing the pix. I’ve always wondered what it looks like up there. It offers a bit of time-traveling quality to a long gone era. When I was a kid in the late 60s early 70s the room I shared with my sister reeked of patchouli and another scent, sandalwood — scents that make me gag now. I remember we also burned incense and all the walls of our room were plastered with posters. We were very stereotypical youths of that time period. The Fillmore (West; I grew up in San Francisco) was always giving those posters out for free. If we still had them (especially the ones featuring Janis Joplin and Jimi Hendrix), they’d probably be as valuable as Apple stock today. I was too high to realize that then. C’est la vie. Hey V, you’re welcome. I have so many more. One of the coolest thing was the guitar sculptures. I think it would have been nicer had it been sunny and cool. Sandlewood has a bit of a calmer scent to it. I know, I still like to have incense every once in a while. Don’t you wish we could go back and purchase/get some of that stuff that worth so much now??? I just watched a bio show about Janis Joplin the other night. Thanks for stopping in, my friend. I wish I still had my Willie Mays autograph. Hurray!! I’m so glad you went on an adventure, Brigitte! It sounds like fun, too—I haven’t been to Woodstock in ages, but I really enjoy going up there. And I know what you mean about it being just as nice to come home. I have not followed through with my resolution to have an adventure, but hopefully I will soon. Your trip will hopefully spur me on! Hi Craves! Why this adventure stuff is right up your alley, huh? Thank you!! I think this adventure is pretty fitting for Brigitte the Bold. 😉 (Sorry, I just HAD to throw in that reference somewhere!) It’s pretty cool to go to places that are a little off the wall but where the locals think it’s the best place ever. I’m sure for them, as you said, there’s really no place like home. Even if it smells like patchouli. Yes, it’s nice exploring something different and thanks, Lillian. I’ve had enough patchouli for one week. ;). Hey Brigitte. That had to be a lot of fun. Frankly, I’m not sure how long I would spend there during a visit. I think I will fell a little out of place. The photos are very interesting. Hi Healthy, it was fun and different and sometimes that’s the best time. Thanks for stopping by, friend. Loved the pics, Brig. Opus 40 looks amazing. My adventure last week, being in the same part of the world, was also rainy most of the time, but it was mostly a gentle rain and warm and it, like yours, it didn’t really matter. Woodstock looks like it’s really fun – but all that Patchouli! Thanks for taking us with you and sharing the sights, smells and sounds of this funky place. And that candle scupture – what were they thinking?! Hi Cathy, thank you! It was pretty cool — huge with huge stone sculptures. It reminded me of Shona sculpture (from Zimbabwe). Yeah it was nice to visit, but not sure if I’d want to live there year round. I didn’t ask how long it took to make that candle sculpture or what may have occurred while it was being made, but I bet patchouli was involved. ;). Glad you had a nice time to and look forward to hearing more about it! Thank you. 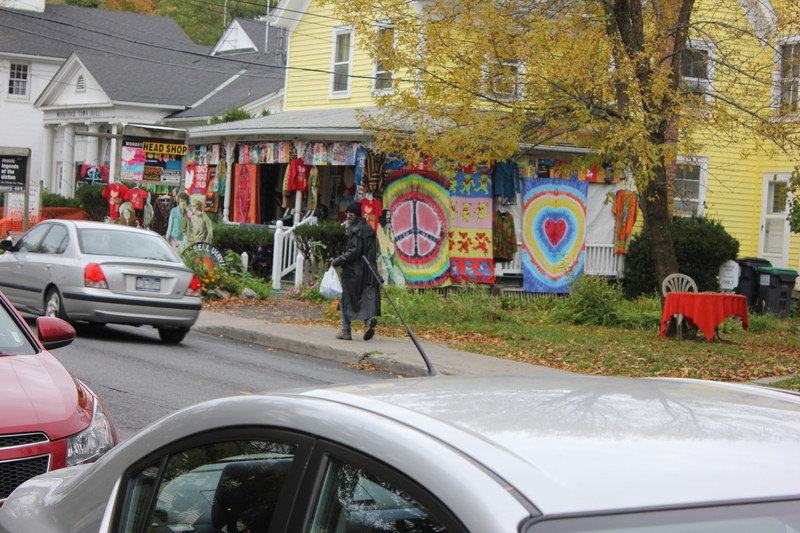 I love upstate New York – we have now shared walking those very streets thru Woodstock! One summer my husband and I visited several of the estates where you can just walk the grounds and thru the houses – it was very lovely. My favorite was Frederick Church – he was an artist and his house was just stunning. Ruta, so you’ve been there too? I think that’s the Artist Colony section? We only had so much time and I think we drove by many of those but the rain put a damper (sorry) on many things we had planned. New York is filled with those quaint little villages. Thank you for saying that, Ruta — it’s nice to be missed. :). I’ve been to Woodstock a few times – my husband lived in Washingtonville (about 40 minutes outside of West Point) – so we’d visit Woodstock, Sugarloaf, and many places around that area b/c it is so beautiful! Sorry the rain was a ‘damper’ – glad you enjoyed your adventure! 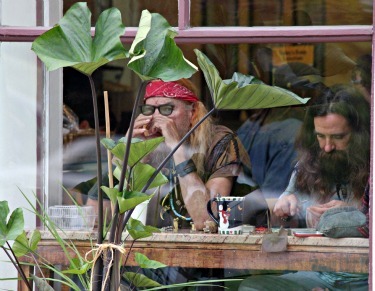 Not that I like the smell of patchouli… but still, I’d love to go to this town and feel the vibe ! in or out of the rain, it must be quite something to be there and meet, or see, so many “characters”! I hope you had a great time and that you’re happy about the adventure, patchouli appart. Hi J, this was actually more than a day, but it was nice getting home. I know your shoe fetish. ;). Thanks for stopping by! Brigitte, this sounds like such a fun adventure! I love the details you share – the patchouli, the velvet pants… I giggled all the way through! One of my favourite blogging pleasures is sharing other writers’ adventures. Thanks for sharing yours! Why thank you, Sally. It was fun and fun to get home as well. ;). Wow! What a very cool adventure!!! The guy with the velvet pants totally cracked me up. I am the same with the traveling thing, actually. Home is such a relief to me. I often wonder if I will curl up and be a hermit someday when I get older and less adventurous. I hope not…because the ying and the yang of home and travel is so awesome. When I am gone from home…I appreciate it more. So glad you had some fun! Now, that’s an adventure I would enjoy. I like exploring places, particularly small, out of the way places. Woodstock (to which I have never been) seems very beautiful, and it would be fun to go there. I like small-town “characters.” We have a few. I loved the pictures you took. The hillside monastery (Brigitte, you people simply don’t have mountains; I’m sorry, but it’s true) was gorgeous, as was the little stream. When I was a kid, I loved the smell of patchouli. But now I have trouble disassociating it from the smell of the BO it’s supposed to mask. Thanks, Smak — it was fun and different. I come from a small town so I guess I could be defined as a “small town character” myself. I’m perfectly fine with that. :). The pics I posted of the monastery don’t do it justice — I had more but I didn’t want people to get too bored scrolling and scrolling. I don’t mind the smell of patchouli in small doses but you’ve probably been to artsy towns where it’s everywhere. Could have been the humidity added to the pungency and I think it masks all sorts of smells. It’s always been big in hippie kind of places. Go ahead say, “You people.” It matters not, friend, I guess we’re all that — depending on what perspective you’re coming from, eh? Thanks for stopping by to comment on my ramblings. Totally, I think you’d fit in well where I live. I do too, Smak. It appears to be a lovely place, from what I’ve read about it. Hooray! Loved the pics and can’t wait to hear more. You must be jet lagged. Do you have an Italian accent? 😉 Thank you. Yes! Too funny, I find myself ending every other word with “eh” 🙂 Jet lagged AND almost toe tagged! So happy to be home with lots of great memories to share! Ah, patchouli. It smells like me pretending to be a hippy in Memphis, Tennesse when I was 16. I was so authentic. And lame. That too. Loved this post, Brig. Makes me want to visit Woodstock. Hi Em, I think we all pretended to be a hippie at one point. Thanks, glad you enjoyed!